A Smuggler of Grand Bretagne, 1843. Home » A Smuggler of Grand Bretagne, 1843. 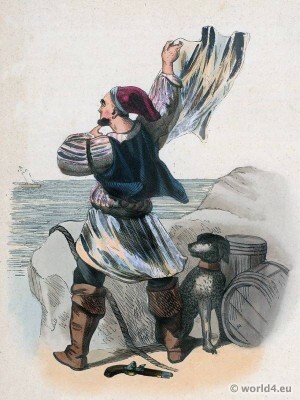 Costume of a Smuggler of Grand Bretagne. The island of Great Britain lies in the Atlantic Ocean, between the Irish Sea and the North Atlantic in the west, the North Sea to the east and the Channel in the southeast, on the north-western coast of the European continent. Historically, there were two Britain: the island (Great) Britain and the peninsula of the United Kingdom (now called Brittany) in the north-west of France. In English they are called Great Britain and Brittany; In French, a distinction is made between Grande Bretagne and Brittany. This entry was posted in 1840, 19th Century, England, Traditional and tagged Auguste Wahlen, Traditional England costumes on 6/28/14 by world4.